Home Learn English What is Euphemism? • Euphemism is a mild substitute for a harsh or rude expression. Euphemism comes from the Greek word ‘euphemia‘, meaning “the use of words of good omen“. • His brother is a retard. Sounds a bit rude, right? अब सवाल है की इन rude words को कैसे avoid किया जाए? जवाब है EUPHEMISM. When to use the euphemisms? • When you need to downplay a sad emotion. ⇒ My uncle passed away. Pass away = euphemism for death. • When you want to convey those ideas which have become a social taboo. ⇒ They broke up because John was sleeping with his secretary. Sleeping with someone = euphemism for a sexual act. • If something is too embarrassing to mention directly. ⇒ You are becoming a little thin on top. Thin on top = euphemism for bald. Next time, before you say something unpleasant, take a moment and euphemise your words. 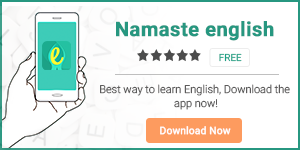 To learn more such new things about English conversation skills, download our application Namaste English. Previous articleEnglish Phrases With the Word TIME.